I’m not one to get mired in election cycle coverage often, but then I saw “news” stories like this one claiming that the presidential election is actually close. This is not true. Barack Obama is almost certainly going to win this election, and his margin in the electoral college is probably going to be more than a couple of states large. Here’s why. They are looking at national polls rather than state polls. They are looking at individual polls rather than averages of large numbers of polls. Now, before we dissect this further, please be aware that I am not saying this out of political loyalty or bias. I’m the sophiarchist–I’m suspicious of the entire system’s ability to get things done. Full disclosure, I do not like Romney. I think he has misled the public, that his tax plan doesn’t really work, and so on. Search his name on the blog if you want to read about that stuff; that’s not my purpose here today. Furthermore, I do not think that Obama’s re-election is going to be particularly helpful or provide any panacea. I expect that the next four years will be like the last two–divided government and gridlock. When I say that Obama is going to win, I say it not out of any intense desire to see Obama win, but because there is empirical evidence to suggest that it is actually going to happen. That said, let’s get to why this will happen and why people are telling you different. Let’s start with the first mistake. In some national polls the election is very close; Romney even sometimes has a slight lead. However, the election is not decided at the national level. Imagine, for example, the following scenario. In Alabama, Romney leads 60% to 40%. In Ohio, Obama leads 52% to 48%. In this scenario, Romney gets more votes nationwide, but Obama wins 18 electoral votes to Romney’s 9. In short, Romney has big leads in the south and the heartland. Where Romney is ahead, he polls in the high fifties, the sixties, even 70% in Utah. In contrast, Obama often has little five or six point leads in states like Oregon, Minnesota, Wisconsin, and so on. Obama has maintained those leads for weeks and months on end–they’re solid, and Obama will win those states, but he won’t win them by a huge majority, and, as a result, sometimes states that have shown a consistent small bent toward Obama get labelled as swing states. 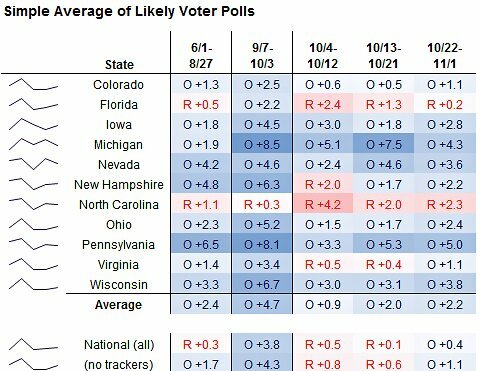 The second mistake is to look at individual polls rather than poll averages. There are dozens of polls taken each week, particularly in the swing states. What many commentators will do is they will take single, individual polls that contradict the majority and hold these up as evidence of a close race. Consider Ohio. Of the last twenty polls listed for Ohio, 17 give Obama a small lead, 2 give Romney a small lead, an 1 shows a tie. The logical fallacy that gets made here is that the 2 Romney lead polls indicate that the 17 Obama polls could be flawed rather than the reverse. The more polls you have saying a given thing, the less likely that all of these polls share a bias of methodological flaw. Based on the poll averages, of the commonly labelled swing states, the model predicts that Obama wins Nevada with 89% certainty, Colorado with 68%, Wisconsin with 83%, Wisconsin with 94%, Ohio with 85%, Pennsylvania with 97%, New Hampshire with 79%, and Virginia with 71%. Romney is predicted to get North Carolina with 78% and Florida with 53%. Bear in mind in case you missed it, these are probabilities of winning the states, not the percentages of the votes that the candidates are going to come away with. Now, let’s imagine that Silver’s model is biased (it isn’t, unless all or most of the polls are, and that’s a pretty big conspiracy) and say that any state it predicts Obama wins with less than 80% certainty actually goes to Romney. Even if Romney wins all of those states, Obama still wins the election 277 to 261. Silver’s overall percent chance of an Obama victory? 85%. That’s not certainty, but it’s a long way from a dead heat. I’m sure many people, maybe some of you reading this, do not like this outcome. That’s completely understandable, if you’re a Romney supporter. If your preferred political outcome is unlikely to transpire, you’re understandably upset and angry. I get that. However, being upset about what is happening does not mean that what is happening is not happening. Accusing Silver and all the pollsters of bias, as some people on the right have begun to do, amounts to self-delusion, because in order for Silver and other modellers to be wrong, not only must some of their polls be biased, most of their polls must be biased; they’re using averages. Historically, this has not been the case–poll averages have predicted fairly accurately the outcomes of past elections. So while I certainly do not expect everyone to be happy with this information, that does not justify irrationally undermining the information with baseless accusations. An unpleasant fact is still a fact. So do not be surprised if Obama wins a comfortable 300 electoral votes or so and we all go to bed early. The other justification I keep hearing, from Romney supporters who do average a quantity of polls – is that they have some built-in bias that over-samples Democrats. They assert the polls are all wrong! But I’m with you, Silver and Sam Wang. No matter who you support, the numbers are what they are. Obama has a great mathematical probability of winning. Yeah, some of them have been claiming that the polls are including more registered democrats than registered republicans, and that this indicates bias. However, in most of the swing states there actually are more registered democrats than registered republicans, with a couple exceptions. I think there are two factors for which you (and the polls) may not be accounting. Voter enthusiasm and thus, turn out, is tough to measure and may favor Republicans. Although Dems likely have a GOTV advantage, nothing motivates like the raw hatred emblematic of the political right. Additionally, the systematic voter suppression efforts of the GOP taking place in numerous states my well become a deciding factor should the vote narrow. I think the final tally will be much closer than you suggest, although I pray you are right. Most polls do exclude people who do not plan to vote. I think the fears of voter suppression are overblown. You have to suppress an awfully large number of votes to make a serious dent in a state-wide race, even if there’s just less than a percentage point of swing. As I often recall, in 2008, North Carolina was decided by 14,000 votes, and that was the closest race. It’s a lot of people to suppress. Not only that, but if there is going to be suppression, it’s going to be new suppression. These models have generally been very accurate about past elections, so if they’re going to be wrong, it’s going to be for brand new reasons that we’ve never seen before. Lets be clear, “I do not like Obama!” Full disclosure I think he’s been lying all along. Nothing wrong with that view, I make these comments independent of political angle, looking at the statistical resources and the compilations of statistical resources available.